If you want to prevent your female pet rabbit from suffering from uterine cancer, spaying is a necessity. That's not the only reason for having this surgical procedure performed on Bunny. Spayed rabbits make better pets, as they're less aggressive and more focused. You also aren't contributing to the rabbit overpopulation problem. Unspayed female rabbits who don't have frequent litters face an overwhelming possibility of developing uterine cancer. According to the House Rabbit Network, up to 85 percent of unspayed rabbits develop uterine cancer by the age of 4. That means your unspayed bunny has only a 15 percent chance of not suffering from this painful and fatal disease. In the wild, rabbits seldom live more than a few years because predators eat them, so they don't live long enough for cancers to develop. Female rabbits are designed to mate and reproduce rapidly. That means the uterus' tissue cells are extremely active, so any mutations causing tumors are common. Besides uterine cancer, spaying your rabbit also prevents the often fatal uterine infection known as pyometra. Once female rabbits reach puberty, between the ages of 3 and 6 months, their behavior can change dramatically. Your formerly sweet bunny becomes aggressive, charging at and biting you or family members. She might also become destructive, as it's the nature of sexually mature female bunnies to dig. If litter-boxed trained, that training might go by the wayside. Once she's spayed, her gentle nature and litter box use should return, while she also lets up on the digging. There are simply more domestic rabbits than their are good homes for them. According to the University of Miami, "Left unchecked, an unspayed rabbit and her intact female descendants can produce more than 1,300 offspring in a year. Over the course of five years this number balloons exponentially to more than 94 million." Unwanted rabbits often end up at animal shelters, where many of them are euthanized. Some people just dump them outdoors, figuring they can go back to the "wild" and fend for themselves. At least euthanasia is preferable to being torn apart by loose dogs or freezing or starving to death. Many rabbit owners don't realize that their rabbit's negative behaviors result from sexual maturity. It's very important to find a veterinarian experienced in rabbit spay surgery. 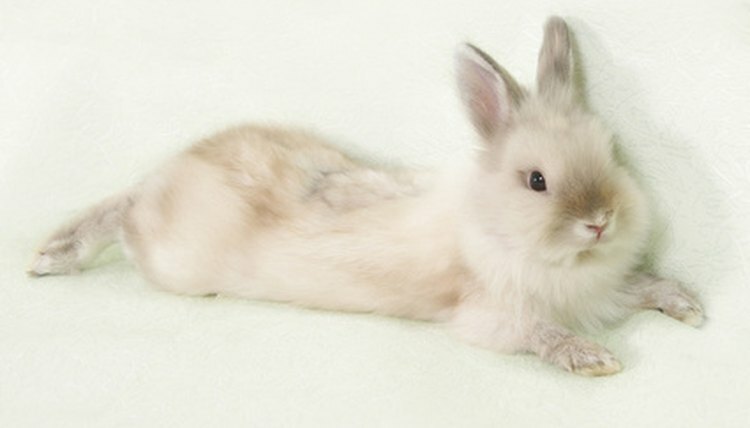 You should already have a rabbit vet, but if you don't, look for an exotic animal practice. Yes, rabbits are pretty common pets, but they're not dogs or cats so they're classified as "exotics" for veterinary purposes. You might find a dog and cat vet who also treats rabbits, but ask her about her bunny experience before scheduling the spay surgery. If the vet tells you to fast your rabbit before the surgery, that's a red alert. It's appropriate for dogs and cats -- not bunnies. University of Miami: Spay or Neuter my Rabbit? House Rabbit Network: Why Spay Your Rabbit? Why Would My Bunny Lose Its Hair? What Causes Milky Urine in Rabbits? How Long Until the Hormones Settle After Neutering or Spaying Rabbits?